I mentioned town signs, awhile back, in a more general post about fascia signage (it’s at this link: http://modelingthesp.blogspot.com/2013/03/layout-fascia-part-2-signage.html ). But I only showed a single example there of a town sign. In the present post, I thought I would expand on this topic a little. Town signs really can help a visitor to a layout, and especially an operator who isn’t very familiar with the layout. A good sign doesn’t just tell you what town you’re looking at, but also indicates which way is local east and west, and perhaps what the adjoining towns are, or even the next major city in each direction. Provided that a faraway town really is a major one — I’m reminded of a time I was starting up a freeway on-ramp with an out-of-state visitor, and he noticed the two on-ramps were designated Fresno in one direction, and Bakersfield in the other. “Which one is which direction?” he wondered, though of course most Californians would know. And of course the (much smaller) sign giving the route number will say something like “99 NORTH” which is a double-check on direction. Anyway, I want my town signs to be as clear as possible, even for people who have no particular knowledge of the area I model, south of San Luis Obispo on SP’s Coast Line. Accordingly, I chose a design emphasizing directions. I showed my first sign, the one for Shumala, in the post which has the link at the top of this post, but for completeness, it’s shown again below. 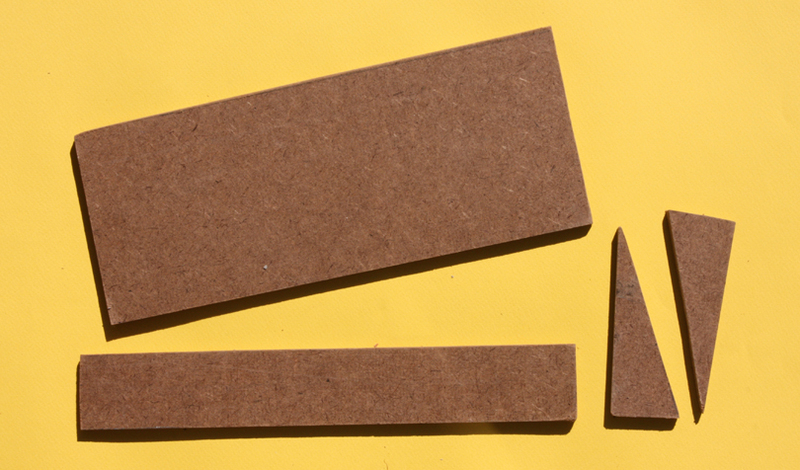 As is the case throughout the layout, the fascia is tempered Masonite in natural color, though given a shellac finish. To see the various towns I model, located on a map of the branch, you may visit an earlier post in which I commented on the locale chosen for the layout (at: http://modelingthesp.blogspot.com/2011/01/layout-design-locale.html ). The major switching location on the layout, lying out in the middle of the branch, is Ballard. Probably any operator would know which direction is back to Shumala, unless he or she had started work in Ballard — as in fact crews do in some operating schemes. Then this sign can help. Here the bottom of the sign is flush with the bottom of the fascia. Finally, the end of the branch at Santa Rosalia might seem to need no sign, but I thought I should include one, for consistency and also to reinforce what the operator already knows. The sign is actually taller than the fascia, thus extends beneath it. But the sign size and proportions match the other signs, which was my goal. A short comment about directions. You may note that east is to the left at Shumala, but to the right at the other towns. Though it sounds contradictory, it’s actually correct. On the Southern Pacific, “westward” was defined as “toward San Francisco,” regardless of geographic direction of a particular segment of track. So leaving the end of the branch, heading toward the main line, brings a train closer to San Francisco regardless of the local geography. I might also mention format and typeface on these signs. I wanted them to be consistent in format and appearance, and you can see that I did accomplish that. The typeface is one I used a lot a few years ago, a digital rendering of what originally was a wood typeface, called “Hamilton,” and still one I find has an appealing period look. These signs have worked well, including for one operator I remember from the Midwest, who really had no idea where any California towns were, beyond Los Angeles land San Francisco. If your layout doesn’t have fascia signs like this, you might want to consider making a few and trying them out. In the previous post on this topic (see: http://modelingthesp.blogspot.com/2016/02/pfes-40-foot-express-reefers.html ), I provided background on the prototype for the Pacific Fruit Express 40-foot steel ice reefers converted for express service. Prototype photos were included to show both the paint and lettering appearance, and also the two distinctive types of trucks applied to these cars. In the present post, I will address modeling, with the InterMountain kit for which the box end was shown in the previous post. This kit is straightforward, and required no noteworthy modeling skills, but I did make a few changes. My kit came with no car weights, so I added my usual two ounces in the form of two 5/8-inch steel nuts. 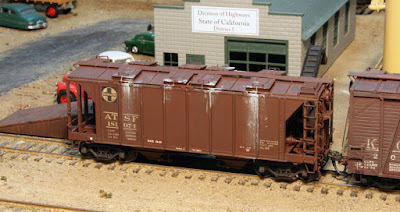 I have said more about this weight application in prior posts (for example, see this one: http://modelingthesp.blogspot.com/2013/06/pfes-western-pacific-cars.html ). I also drilled and tapped the truck bosses for 2-56 screws, and likewise modified the kit coupler boxes by cutting off the post in the lid, then drilling it for 2-56, and also tapping the hole in the body box for 2-56. This makes the coupler box entirely accessible for maintenance with a screw cover. The model here is supported on interim truck blocks pending addition of trucks, an approach I described in an earlier post (you can view it at: http://modelingthesp.blogspot.com/2014/11/interim-truck-support-blocks.html ). Side details are not yet added, as I wanted to take care of drilling the car side before anything delicate was in the vicinity. Incidentally, I did get a question about the dummy fan plate (“what the heck is that?”), and the answer is that the earliest car fans on PFE cars were mechanical fans, and they had a fan shaft visible on the car side, which could be used to operate the fans when they were stationary at a loading dock. Switchmen and others had learned to look in that location for the round shaft housing to identify fan cars, so when electric fans were introduced, needing no fan shaft, the dummy plates were put on such cars as an indication to workers that the car did have fans. It was simply a pressed sheet metal plate. But the trucks are the major challenge to model for any of the first 25 cars in this group, PFE 901–925, because of the Chrysler trucks, which I showed in the previous post about these cars (link at top of this post). I have long postponed trying to duplicate the Chrysler truck shock absorber (one thought was that I might try one of the shock absorbers used on some diesel locomotive sideframes). But at this year’s Cocoa Beach, Florida meeting, Ross Dando had some exquisite resin castings of a complete spring package and shock absorber for these trucks. He was kind enough to give me a few of these castings. Here is a photo. A set of these can be purchased from Twin Star Cars (you can visit them at: http://www.twinstarcars.com/ ) for $5.00 plus shipping, though these parts are not currently on the website. You will need to contact Twin Star directly to order. Then when the spring area was filed flush with the rest of the sideframe, it looked like this. I sanded down the spring castings from the back so they would sit better. I used canopy glue to attach the new spring package, which is easy to see below because it is a light gray color. It may seem at first glance that the shock absorber package sticks out quite a bit, even when thinned, but if you look at the prototype photo in the prior post (see the link at the top of the present post), you will see that the prototype package also protruded quite a bit. I will show the painted trucks when they are on the completed model. Most of the remaining work on this kit is simply a matter of adding details. I will show the car in finished form in a following post. Once upon a time, I had little boxes along the fascia of my layout, with pockets where waybills were placed when cars were set out, and from which they were retrieved when picked up. Frankly, I was never crazy about this arrangement, not least because the boxes protruded into the aisle, and even the best-meaning visitor could bump them, either spilling the waybills or injuring him or herself on the sharp corners. I did make them out of clear plexiglass, but they still seemed intrusive to me. Here is one of them, containing the old Allen McClelland 3 x 5-inch waybills. 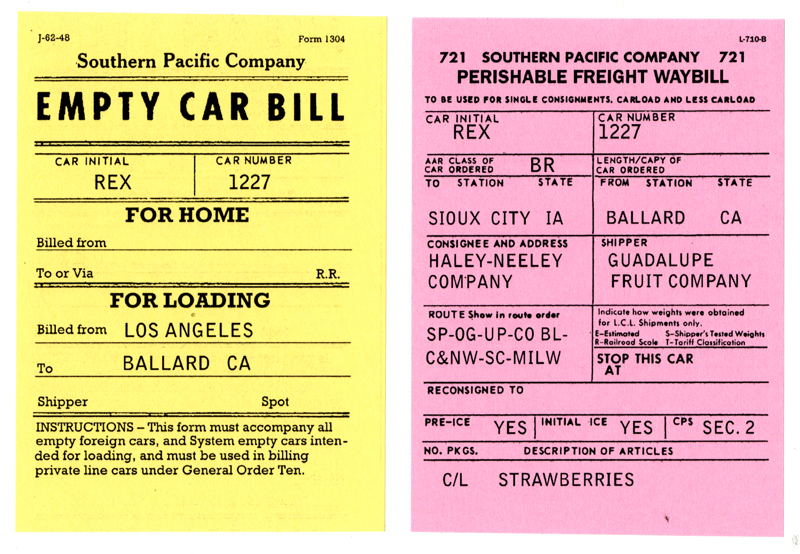 I now use an entirely different system of waybills (see for example my collected prior waybill blog posts available on Google Drive via this link: http://modelingthesp.blogspot.com/2015/12/waybill-posts-collected.html ). But rather than make new little boxes (which have always seemed to me to be support for a waybill process that is wildly unprototypical), I have crews pick up their waybills and agent messages at each town, and when done with their work, return all completed paper to the bill box. However, there still has been no convenient way on my layout to sort and work with waybills, short of spreading them out on the surface of the layout. 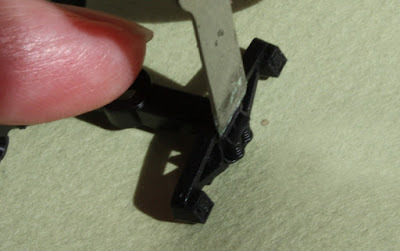 I remembered a nice solution to this problem, shown in Model Railroader articles and included in their special issue, on “How to Operate Your Model Railroad,” which is still available at the Kalmbach site: https://kalmbachhobbystore.com/products/special-issues (scroll down to it). 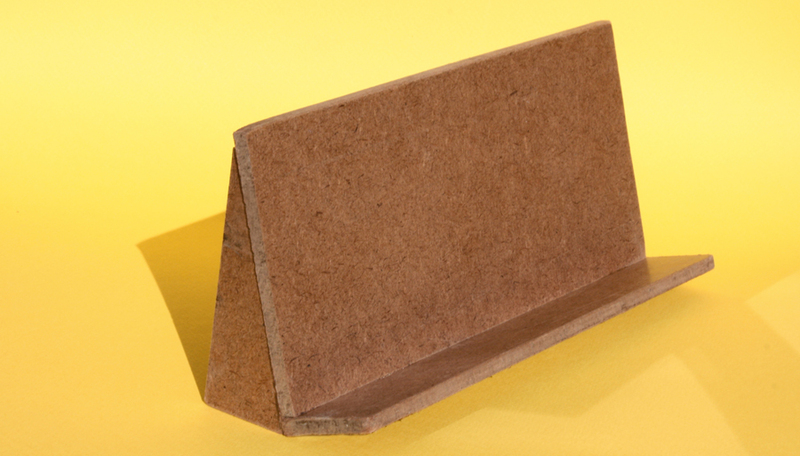 The idea was to make a pretty simple shelf out of hardboard; see for example pages 27 and 79 in that issue. I glued these together with yellow carpenter’s glue, and clamped them until dry. As assembled, the shelf looks like this. The shelf is to be attached to the layout fascia with screws through the top of the shelf. The next photo below shows the shelf as installed at Shumala on my layout, with a passing train on the main line just above it. Shown on the shelf are a couple of my usual waybills, but of course these could be any waybills you happen to use. Incidentally, the waybill at far right is one of my “stop off” bills. I described the prototype and modeling of this form in a prior post (see: http://modelingthesp.blogspot.com/2016/01/waybills-part-47-stop-off-form.html ). To the left of the new shelf can be seen the Bill Box for Shumala, where crews pick up and drop off their paperwork. When the layout is going to be open for an open house tour, I can unscrew the shelf and get it out of the way. This shelf will help crews at Shumala work with their waybills, and I will probably build a second one to use at Ballard, on the other side of my peninsula. This shelf design is a pretty quick and easy project, if you feel you need something like this. This question is one that has come to me from time to time, from people who know that I have both hosted such sessions, and participated in a lot of them hosted by others. The first question I ask such a questioner is usually “What kind of layout do you have?” Obviously some kinds of layouts would be tougher to present for operation than others. But to start, a layout does not have to be large. It primarily has to offer multiple operating possibilities. So that one-time classic design, in which trains run “round ’n’ round” and cleverly are always popping out of tunnels where you least expect them, is really most suitable for the enjoyment of a single operator, who back in the day sat at a massive control panel and ran the entire show. It might be hard to construct an operating session on that kind of track plan. Likewise, a shelf layout or a ping-pong table layout might offer limited scope for a session, though it depends on the track plan. But those who ask the question of my title usually already know that much, and already hope they may have a “good enough” layout. My follow-up question usually is about reliability. If you have guests trying to do complex switching moves, or run a local train dodging among a line-up of mainline trains in a busy schedule, the occurrence of derailments, shorts, or electrical dead sections is really disappointing. So I would emphasize that derailment gremlins must be found and eliminated, and likewise electrical faults, especially shorts, have to be thoroughly exorcised. A visiting operator expects to operate, not troubleshoot your layout as a kind of beta tester. Of course, there is the well-known and often demonstrated adage, that there are always faults which show up in the presence of visitors but not otherwise. This of course is partly true because your visitors may operate a little differently than you do, and also they are running more intensively than you are probably used to doing. But you have to note every fault and fix it before the next session. 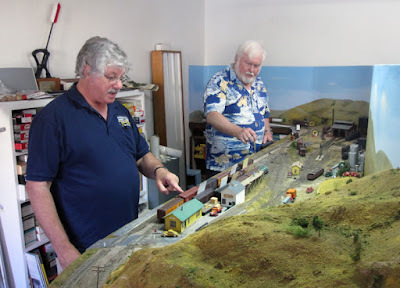 I once operated on a layout which was very much still under construction, all plywood, zero scenery or structures, and though the trackwork wasn’t bad, we did find a number of problem areas. The layout owner knew that was coming, and circulated among us with a pencil and pad of paper in hand, writing down every problem and its location. That’s the attitude you need to have. Another point to consider is aisle width. If your aisles are narrow, as is often true, it may be hard for all the needed crews to work. 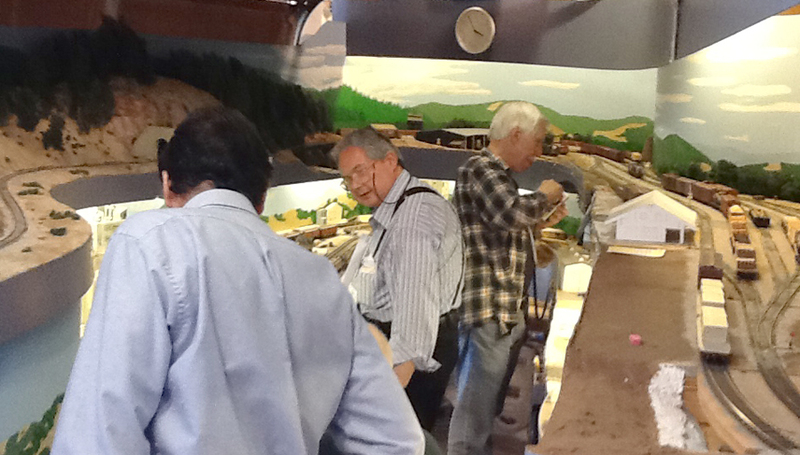 Here is an illustration, in the form of a photo at Ed Merrin’s layout, showing me at right, former SP dispatcher Rick Kang at center, and layout owner Ed Merrin at left, during an operating session on Ed’s fine Northwestern Pacific layout. Rick is asking Ed for clarification on switching procedures at Petaluma, which he is working. As this photo shows, several people may be pretty busy with different tasks, and space may be tight. The operating system you devise has to take space into account, so everyone can do their work. My own layout continues to divulge new and different faults during operating sessions, but in truth, so far they are few in number and minor in effect. Overall, I think I can at least say “pretty reliable” as to mechanical and electrical dependability, and my waybill system seems to work for some moderately complex switching. Below is a photo from a session last September, with Shumala crew Seth Neumann at left and Bill Kaufman at right, working out their next switching move. At least I don’t lack for aisle space. One point I think is important to repeat. You do not have to have an immense layout to have operating sessions. In fact, I have had some impressively good experiences operating on rather small layouts. And my own layout is none too large, in fact accommodates only four operators, as two two-person crews, but they are usually busy for the full three hours of a session. What counts is that you have enough work for crews to do, and that the layout, including rolling stock and locomotives, performs reliably (on that last point, do clean track and locomotive wheels before your session! it makes a difference). Lastly, I would always urge someone asking about operating sessions to read and reflect on one of the fine books out there about operations. Any one of them will give you dozens of ideas for things you can do. I wrote a post about such books a couple of years ago, emphasizing a few of them (you can find it at: http://modelingthesp.blogspot.com/2014/03/tony-koesters-recent-operations-book.html ). The Kalmbach operations book by Tony Koester remains in print, and is as good as they come (it’s readily available on-line: https://kalmbachhobbystore.com/products/books?page=2 and scroll down). I also recommend a Model Railroader special issue on “How to Operate Your Model Railroad,” also still available at the Kalmbach site: https://kalmbachhobbystore.com/products/special-issues . These points are all fairly broad, but with them as starting points, I think that many layouts can host effective operating sessions. It just takes some planning and perhaps a little imagination, to envision what kind of crew assignments will work on your layout. Of course, whether you, as the owner, wish to actually try a session is entirely your own affair. But I think you would find it fun. Modelers are familiar with the conventional express refrigerator of the steam and transition eras, a 50-foot, wood-sheathed car having long-wheelbase trucks, often with outside equalizers. 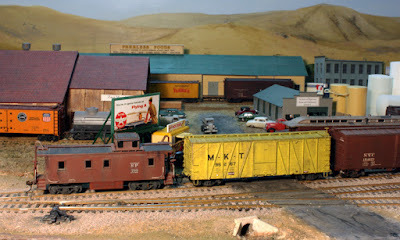 But there were exceptions, and I want to include examples of exceptions as part of my express reefer operations, described in a previous post (you can see it at this link: http://modelingthesp.blogspot.com/2016/02/operations-seasonal-traffic.html ). 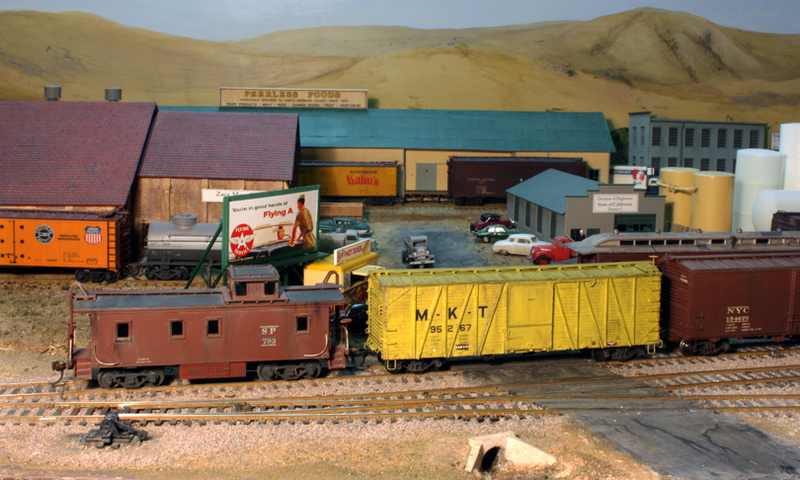 In that post, I included a model photo of a conventional 50-foot car, the Walthers version of General American’s widely used wood express reefer. First, some background. The first all-steel ice cars on PFE were of Class R-40-10, built in 1936 and 1937 with typical car specialties of the day. Running boards were wood, ice hatch covers were separately hinged from hatch plugs, and the cars had no fans. By 1950, these features were obsolescent, so PFE began to upgrade the R-40-10 cars a few at a time, whenever there was shop time, and the visible signs of the upgrade were, most visibly, a steel grid running board. Electric fans were also added, which could be seen as a fan control box below the car side (on the left side of the car only). This upgrading program went steadily but slowly along and was not completed until 1954 or 1955. When the decision was made to convert some steel cars for express service, 50 of the upgraded R-40-10 cars were chosen. These cars were most visibly changed by being painted the standard SP passenger car color, Dark Olive Green, and lettered in Dulux Gold. They also received the usual passenger air brake equipment, including steam and signal lines, and marker light brackets at the four car corners. Here is the first of the 50 cars converted, PFE 901. The dummy fan plate can be seen above the left truck, and the fan control box is below the fan plate. 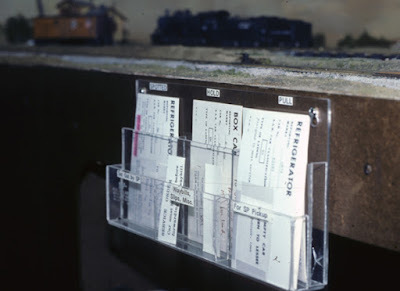 Placard boards are arranged as on the contemporary Class R-40-25. (PFE photo at Los Angeles Shop, author’s collection) You can click on the image to enlarge it. The next most visible change, after the Dark Olive Green, was the addition of high-speed trucks. Union Pacific had carried out a test application of two kinds of high-speed freight trucks on their stock cars in Daylight Stock train service, but had chosen roller-bearing trucks instead, and were now prepared to sell the second-hand solid-bearing trucks to PFE. The 50 pairs of trucks comprised 25 Symington-Gould Type XL pedestal trucks, and 25 Chrysler FR5-D trucks. The latter had Symington-Gould sideframes much like conventional AAR trucks, but were visibly distinctive with the addition of a shock absorber on the outside of the sideframe. The Chrysler truck was also a swing-motion design. Both trucks are shown in drawings and photographs in the 1949–51 Car Builders Cyclopedia. The first 25 of the converted cars, numbered PFE 901–925, received the Chrysler trucks; the second 25, PFE 926–950, received the Type XL trucks. Here are both prototype trucks, with the Chrysler truck at left. The Chrysler photo is from PFE (California State Railroad Museum collection), the Type XL photo is from the 1949–51 Cyclopedia. In the photo above of PFE 901, the Chrysler trucks are hard to see because they are painted black, but the photo immediately above should clarify the appearance. I want to just mention my modeling approach here, and will go into more detail in a subsequent post. One starting point for these cars, of course, is the InterMountain undecorated kit for PFE Class R-40-10. This same model has been offered from time to time in Dark Olive Green, and at the moment, InterMountain continues to catalog an R-40-10 model decorated for express service (their catalog number 47612) in ready-to-run form. But be aware they also offer the same decoration on an R-40-23 body, which is incorrect. Even built stock, but in Dark Green, the R-40-10 model surely captures the general look of these cars. The same might be concluded even for an Athearn 40-foot steel reefer model, painted Dark Green, though the body is that of a later class, R-40-23, and could only be a stand-in. 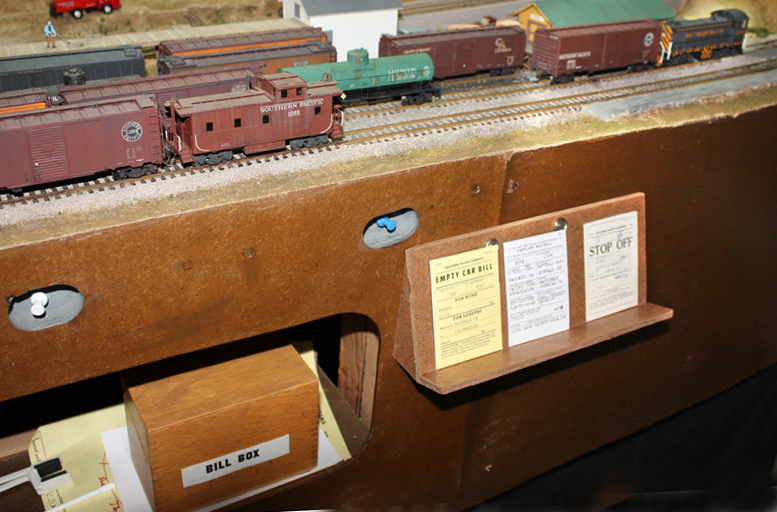 As mentioned, roofs of model freight cars are very visible to viewers, so adding an Apex steel grid running board is an excellent step in making any such models more accurate. More than a decade ago, the Southern Pacific Historical & Technical Society arranged with InterMountain to offer a convention car with this model. Here is a box end to show how it was described. This kit was a special run, but as mentioned above, see InterMountain’s website (visit this link: http://www.intermountain-railway.com/ho/horeefers.htm ) for availability of ready-to-run versions. The other issue is trucks, as described above. The Symington-Gould Type XL truck is much like, though not identical to, the Cape Line T-13 truck, and I have used that for PFE cars 926–950. For the Chrysler truck, there is no commercial equivalent, but I will show in a following post how I attempted to reproduce this truck while building the kit shown above, PFE 909. In previous blog posts, I have occasionally touched on the point that all railroads have at least some seasonal traffic, anything from iron ore railroads being inactive in the winter, to heating fuel (coal or oil) more heavily used in winter, and to lumber, and building materials generally, primarily moving in the months when construction activity is strongest. An obvious part of this story is produce, with many crops highly seasonal, some with harvesting periods measured in weeks, and at the other extreme, crops like carrots, which in California are grown and harvested year-round. That brings me to my layout, on which there are six packing houses of different kinds. One of those prior posts (see: http://modelingthesp.blogspot.com/2011/08/few-words-on-packing-houses-and-produce.html ) was part of a thread about packing house modeling. A post last fall went into more detail as it applies to my layout (see it at: http://modelingthesp.blogspot.com/2015/09/seasonality-of-crops-and-traffic.html ), and included specific charts for the area of California in which my layout is set. I listed in that post the particular vegetables being shipped in September, the month of posting. In February, the month of the present post, things would be quite different. However, the charts shown in the 2015 post just cited are for the entire year, so one can simply look up any month of interest. The charts clearly show that the vegetable shipments from the area of my layout in February and March were dominated by broccoli and cauliflower. Carrots were included too. An intriguing detail is that by March, the first strawberries were being harvested in California, particularly in the Oxnard and Ventura areas, but also near Santa Maria. The first of any crop could well bring sufficient prices in the East that early shipments would go out in express refrigerator cars. The same is true of tree fruits like cherries, and for other products such as the first salmon of the season. Accordingly, my planned operating session in early March will in fact include express reefers for strawberries. I can also include a few loads of oranges, as shown in the 2015 post’s charts, and can do that from my packing house in Shumala, Phelan & Taylor. This is part of making a March operating session distinctively different than sessions would be in late spring, in summer, or in the fall. In planning operation with express reefers, it is useful to know whether your prototype railroad did or did not participate with the Railway Express Agency in the REA express reefer pool. In addition to its own considerable fleet of these cars (more than 1500 in 1953), REA also operated the reefers of several other companies, including PFE, Santa Fe, Pennsylvania, Atlantic Coast Line, Seaboard Airline, Great Northern, and a few others. Those railroads not in the pool could supply their own reefers (for example, NP), or if they owned none, would have to call on the pool for cars. It was REA’s responsibility to provide needed cars if railroads did not have their own. The cars in the pool remained in their original ownership, PFE for example, and any maintenance beyond light repairs was the responsibility of the car owner. But REA carried out cleaning and light repairs for cars away from home rails, managed distribution of the cars, and handled return of empties according to their own needs. It’s known that REA tended to keep pool cars approximately in the area of the car ownership, so they would be convenient to owners’ shops for any extensive repair needs, but any car in the pool could and did show up almost anywhere. My own fleet of express reefers has several PFE cars in it, but also has a couple of REA cars, and a couple of off-line roads too, such as Milwaukee and New York Central. These could be confiscated for loading if made empty and not needed urgently back by their owners. I’ll illustrate part of my upcoming operating session with one of the REA cars, being switched in front of the Shumala depot. REX 1227 is a Walthers model, with weathering added. 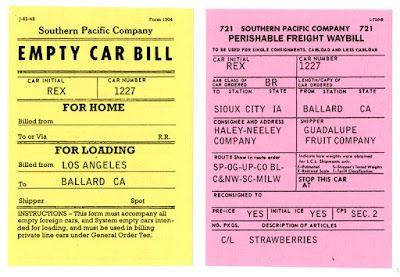 Here are the waybills used to move this car, first the incoming Empty Car Bill, directing the car to the shipper in Ballard (the Ballard agent can tell the local crew where the car goes, though there is only one shipper at the moment using express cars, so probably no directions are needed). The waybill then directs the car to its destination. This is a simple addition to my operating patterns, but makes an interesting change with these express reefers, which are entirely different looking compared to the usual 40-foot yellow or orange cars that are loaded at my packing houses during most of the year. I may have to repeat it for other early crop harvests! In a prior post, I showed several recently completed freight cars, none of them noteworthy for any special construction or detailing aspects, but of interest as a way to show the kinds of projects I have been working on. I think each adds to and improves my freight car fleet (that post can be found at this link: http://modelingthesp.blogspot.com/2016/01/recent-freight-car-projects.html ). I have always wanted to model one of the Katy yellow box cars, and delayed doing so for some time, but finally did buy the Speedwitch Media kit (their no. 105.5) and here it is, moderately weathered (by my modeling year, 1953, Katy had discontinued this paint scheme and was back to repainting box cars in conventional mineral red). 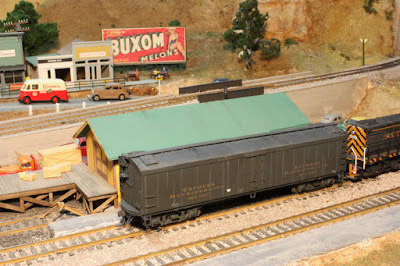 The car, MKT 95267, was caught in a freight at the Nipomo Road crossing, just entering Ballard on my layout. 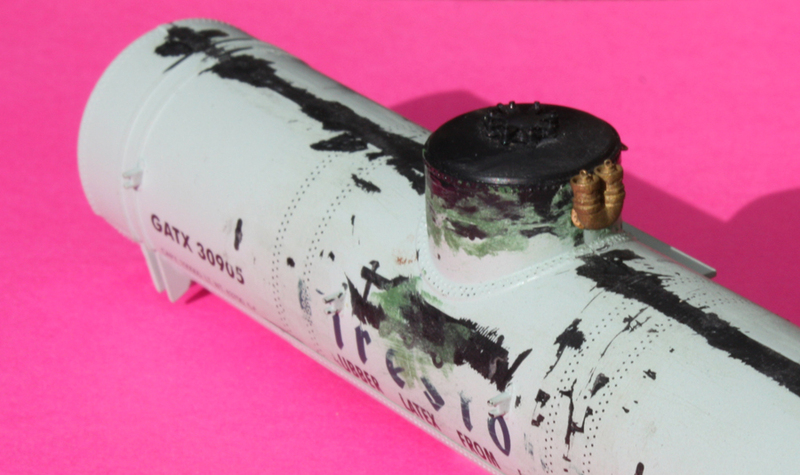 A few blog posts ago, I described a modified Athearn “chemical” tank car, which I converted to an insulated ICC-103 type by adding a Tichy expansion dome (you can read my description at: http://modelingthesp.blogspot.com/2015/12/modeling-insulated-tank-car-part-2.html ). In that post, I showed the completed car, SHPX 13146, prior to weathering. Here is the car with weathering added, and a few chalk marks, shown made up into a train at Shumala. 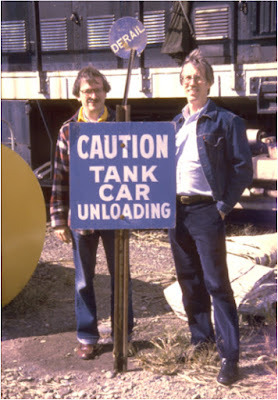 Note the car has both a placard for its load, and a route card attached to the edge of the wood running board, as was often done with tank cars. Another recently completed tank car was this next model, a superbly designed and executed resin kit from Southern Car & Foundry, modeling a car which has had two end compartments added after the car was built, thus the smaller domes at each end. Moreover, it is a Standard Tank Car Company (STC) design, with its distinctive STC bolsters. It was built by Dennis Williams and finished by me. The paint scheme of NATX 3403 exactly follows a prototype photo, including Du Pont’s typical light gray paint (a color rendered incorrectly on some models as silver). As I did in the previous post in this series, I include here a ready-to-run car, since I do add those to my car fleet when needed. The one I show here is an InterMountain covered hopper, lettered as Santa Fe 1946-built Class GA-65, which like other Santa Fe covered hoppers of the time, was a distinctive car because the Santa Fe ordered it with inverted T-section roof seams (the ribs on the roof). When InterMountain announced this version of their fine covered hopper model, I ordered one at once. As I have chosen to do the weathering, the car is depicted as serving in cement service, with some staining evident on the boxcar-red sides (in-service photos of these cars show that actually I have if anything underweathered it). It’s shown at its on-layout destination, the California Division of Highways facility in Ballard. Unfortunately, InterMountain misnumbered this model as ATSF 181974, using a number within the 1942-built GA-58 class (of which Class GA-65 was essentially a carbon copy). Since the bodies are identical, for now I will live with the clash between car class and number. Lastly, for awhile I’ve intended to buy one of the Rocket Express double-door 40-foot box car kits, and as it happened, one was among the kits I inherited from Richard Hendrickson. It’s kit RI-1. Dennis Williams built and painted the model, and I did the lettering and weathering of RI 160368. As has been observed by several authorities on the Rock Island, cars like this had black roof color into the 1950s, so I have done the same. In this view, it’s being switched at Shumala. These additional projects may be of interest for a variety of reasons. It’s my intent that they typify the way I choose and prepare freight cars to join the active fleet on my layout. In the previous posts on this topic (the first can be accessed from the previous one, at: http://modelingthesp.blogspot.com/2016/01/running-boards-part-2.html ), I addressed the topic of how prototype wood running boards appear in service, and a little on modeling the observed variations in appearance, using Prismacolor color pencils.Variations shown so far were modest, and in this post I want to take up more dramatic variations. I should hasten to observe that these dramatic cases were relatively rare, and ought not to be present on more than a few cars in a freight car fleet. I will illustrate this post with a couple of examples of Bill Welch’s work. At the Cocoa Beach 2016 meeting concluded last month (see my post discussing that meet, which is at: http://modelingthesp.blogspot.com/2016/01/cocoa-beach-2016.html ), Bill showed a number of models with differentially weathered running boards. Some of the cars had more heavily distressed group of planks in the running board, as with the photo below, showing a Wabash automobile car, WAB 46017, built from a Sunshine kit. The descriptive note with this car stated that it was still “in progress,” so weathering seen here may eventually be softened. But already in this state the model does emphasize the wood nature of the running board, and certainly shows variations. I think a few models in this condition would be a good addition to any fleet. This version is interesting because of the boards which might be unpainted replacements, though pretty dirty. I decided to try representing a single board as a fresh, unpainted replacement, and obtained the result below. I used P-B-L’s Star Brand “Natural Wood” paint, their number STR-12 (for their website, visit http://www.p-b-l.com/pbl2002/main-25th_Anniversary_NJ.html , click on Online Catalog, then pull down the top center menu under Categories to no. 22, Paints / Cements, and scroll through the list). I like the outcome you see below, but don’t intend to add more, as I would think this kind of appearance would be rare. I think most shops replacing a plank in a running board would have paint handy and enough time to daub a coat of body color onto the new plank. I tried that type of appearance on an InterMountain PFE Class R-40-10 car, as you see here, with a fairly dirty roof. The older planks have been given somewhat different colors using the Prismacolor pencils mentioned previously, and just one plank was simply overpainted with boxcar red right from the bottle. Finally, in Bill’s exhibit he included what I would call a pretty extreme (though certainly possible) example, a car with not one but several missing planks in the running board and the lateral boards. 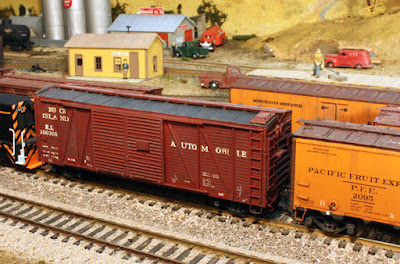 It is a Wright TRAK kit for a ventilated box car, built as Seaboard 89728, and it looked like this. In fairness to Bill, he did explain that he does not consider the kit quite finished, so what we see here may be modified later. As I have mentioned, any car with the defects as we see them here would be sent to the local repair track as soon as the defects were noticed. Safety appliances were required to be kept in repair. (AAR Interchange Rule 21 required owners of cars to pay for running board repairs, although carried out on foreign lines, and cars with unrepaired running boards should neither be offered nor accepted in interchange, Rule 32.) But this kind of thing could perhaps be seen in service. Omitting just a single plank might be more realistic. I have been working my way through a number of my freight cars with wood running boards, and finding, as I mentioned in a prior post, a bunch with weathered or distressed running boards, but a substantial number with just plain roof color. I am steadily correcting many of those cars, often with something I hope is as subtle as Bill Welch’s Georgia & Florida box cars, shown just above. Thanks for the ideas, Bill. About a year ago (see: http://modelingthesp.blogspot.com/2014/12/modeling-sp-class-o-50-9-tank-car.html ), I began a project to model one of SP’s distinctive tank-car classes, Class O-50-9, which had circumferential top sheets and elbow safety valves. Until fairly recently, there were no decent options to model cars bigger than 6500 gallons with elbow mounts, because the kind of elbow mounting arrangement used for the two safety valves required for such sizes were paired in a single elbow mount. All that changed with the introduction of the Owl Mountain Models parts for both single-valve and double-valve elbow mounts (their part numbers 1001 and 1002). 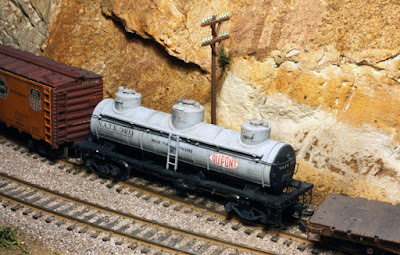 You can see these parts on the Owl Mountain site if you like (visit: http://www.owlmtmodels.com/detail_parts/detail_parts.html#Vents and scroll down to these safety valves). That got me started on Part 1 of this thread, which is the post cited at the very top of the present post. I dug out an Athearn single-dome tank car kit, lettered for Firestone as you can see in the prior post, and proceeded to strip off all unnecessary rivets and also the dome walk on one side. Then I raised the dome height to the correct size in the way I have shown elsewhere (my method is shown clearly in this article: http://modelingthesp.blogspot.com/2011/05/modeling-sp-tank-cars.html ). At that point, I wrote up and posted the description cited at the top of the present post. Next, I wanted to install the Owl Mountain safety valve part. This is very easy, as it only requires a no. 46 hole in the side of the dome. As I usually do with dissimilar materials, like joining this bronze part to a plastic car body, I used canopy glue (if not familiar with this very useful adhesive, you may wish to read my remarks and discussion, which is at: http://modelingthesp.blogspot.com/2013/05/a-few-words-in-praise-of-canopy-glue.html ). In the photo below, you see this part, along with a grab iron on the walkway side of the car’s dome, made from 0.012-inch brass wire. Note that a riveted flange (at the dome surface) is supplied as an extra part with the elbow safety valve. From the other side of the car (the left side), where the dome walk has been removed, the photo below may provide a better angled view of the whole part. The next step on the car body is the addition of the two overlapping sheets of the circumferential sections on the car body. Dividing the body length into five equal parts, each segment would be about seven and a half scale feet long. But the prototype photos (see previous post in this series) shows the sheets did not come right up to the base of the dome, which they would have to do with if all segments were of exactly equal length. I elected to make all four segments other than the center one, exactly seven feet wide, which is close to the dimension scaled off prototype photos. To represent these sheets, I decided to cut the two outer or “overlapping” sheets from 0.005-inch styrene sheet, using one of the old 3-hole “sheet protector” plastic enclosures. Gluing these sheets to the styrene tank car body would seem to call for styrene cement, but unless used very sparingly, this cement easily shrinks and distorts sheet as thin as this. Instead, I glued them to the body with canopy glue (see the post about this glue cited above). The sheets were held tightly to the body under rubber bands, and I wicked a little styrene cement under the sheet ends, on each side of the body, at the bottom. Here is the first sheet being added. Though the added styrene sheet is transparent, you can see its width by the reflection against the black area along its top, under the rubber bands, in the photo above. I allowed it to dry overnight, then repeated the process for the second sheet. This method of attachment worked well. The new circumferential sheets are now ready to receive double-row rivets at their edges. The Archer Fine Transfer product to use (see: www.archertransfers.com) is one explicitly designed for tank car double rivet rows, their part AR88031 (for the application process and discussion, see my post at: http://modelingthesp.blogspot.com/2011/06/modeling-sp-tank-cars-3-tank-sheets.html ). 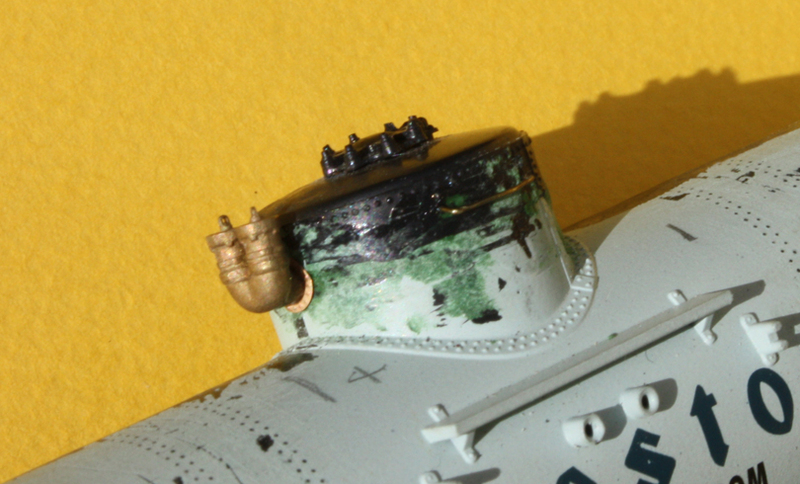 But there is one thing to be careful of with Archer rivets, and that is to handle the model as little as possible after riveting, until a coat of paint, or Dullcote, or something, is added to protect them. Accordingly, all additional work on the tank body should be completed before applying rivets (and promptly thereafter, paint). This brings me to the end of this post. In the final post in the series, I will complete the car (underframe modifications are the same as for several other Athearn tank car projects I have described previously), along with paint and lettering. The latest of my “Getting Real” columns in MRH (Model Railroad Hobbyist), which has just appeared in the February 2016 issue, is about tank cars. It describes their prototype design, construction and use up through the 1950s. (A “second section” of the column, expected next month, will address modeling.) As with all issues of MRH, you can download it at any time for free from their website, which is: www.mrhmag.com . Putting this column together was an interesting exercise, because it took me back to the time, 30 or so years ago, when my good friend Larry Kline and I dreamed up the clinic topic of “Tank Car Basics,” because we recognized that many modelers had only the most fuzzy understanding of how a tank car is constructed, and how and why it is used for particular cargoes. Larry and I used to like to visit tank car loading or unloading sites whenever en route to a convention or other railroad activity. At one of those stops, C.J. Riley, the third member of the Iron City Ferroequinological Society (ICFS) took this photo. That’s Larry on the left, me on the right. I have commented before about ICFS and our activities; see for example this post: http://modelingthesp.blogspot.com/2013/07/that-red-icfs-truck.html . In my memorial to Larry, who passed away in March 2014, I included this same photo as a good memento of us together (you can read it at this link: http://modelingthesp.blogspot.com/2014/04/in-memoriam-larry-kline.html ). When we first combined our slide collections to create a talk (yes, talks were given with 35-mm slides in those days), we planned it so I could give one half of the talk, Larry the other half. 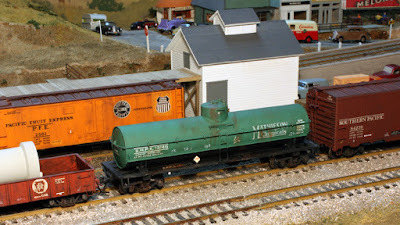 At that time, Larry had been developing additional tank cars for his O scale layout, and as few prototypes as there are in model form in HO scale, there are far fewer in O scale. But gradually Larry lost interest in the talk, so I took over presenting the whole thing whenever it was scheduled at a convention, and it was given intermittently for years, up to today. But I decided it needed to be in text form somewhere too, thus the MRH column. Minor point: the good folks at MRH managed to omit the Appendix from my column (it’s a summary of landmark dates in tank car history, and is mentioned on page 17 of the column). Accordingly, I insert it here, in case you noticed the mention and wondered where the Appendix was. You can click to enlarge it. That is some of the background for my February 2016 MRH column. As I stated, Part 2 on modeling is expected to follow in the March issue.